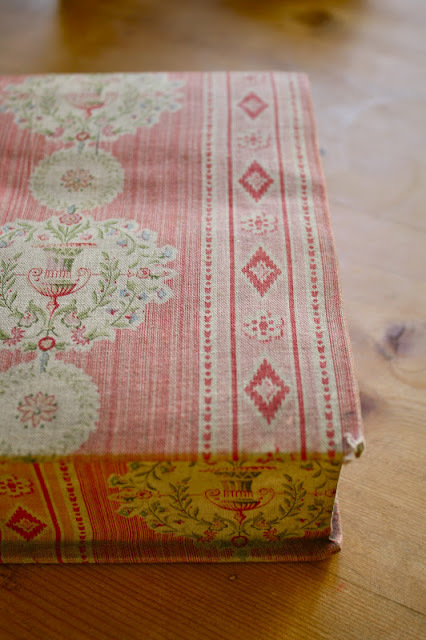 I promise I am almost to the end of my Paris posts and then I will go move on. I never know how much to share about a place without boring to you death. I only know I was appreciative when I read posts about Paris from Heather Bullard before I went. 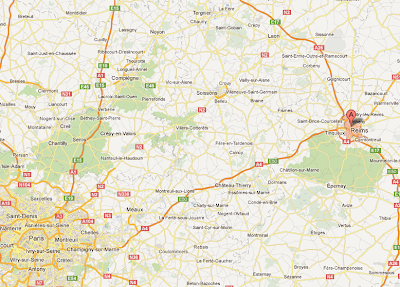 Anyway, I wanted to share with you a few places I visited (and loved) that might not be on the typical tour of Paris. If you have been before or are staying longer than a week...maybe looking for something different, you might consider visiting one of these. 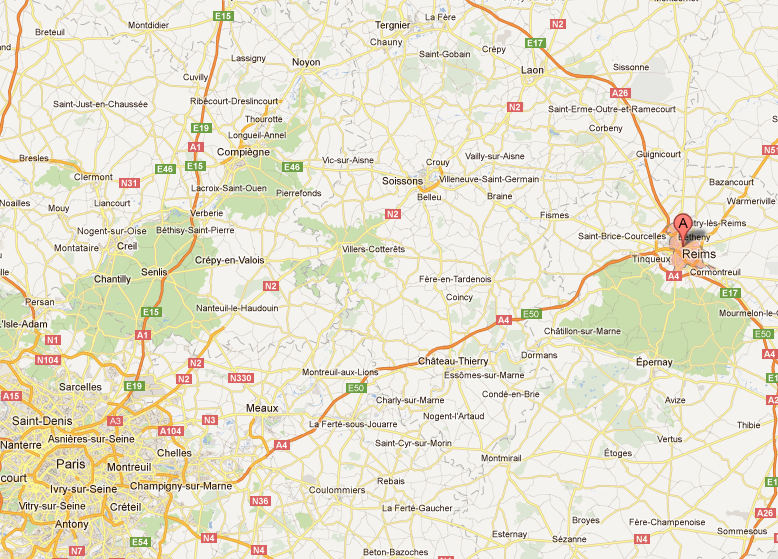 Location: 100 miles north east of Paris. Easily accessible by private car or train. 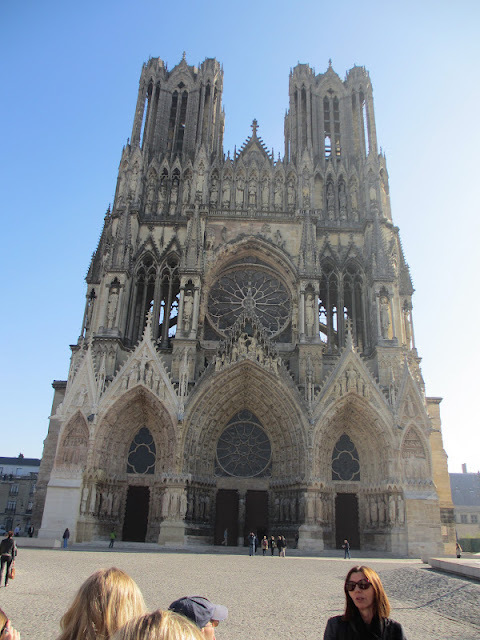 Sande and I took a charted bus trip out to Reims (rhymes with France) to see the Notre Dame de Reims. 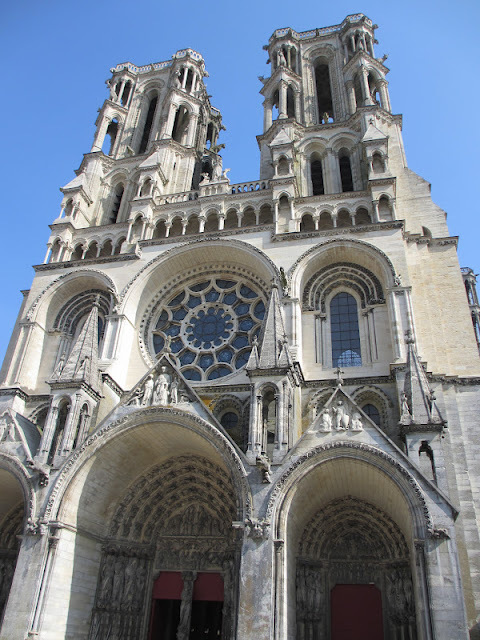 The cathedral, which began construction in the 1200s, is where all almost all of the kings of France have been crowned since 816. 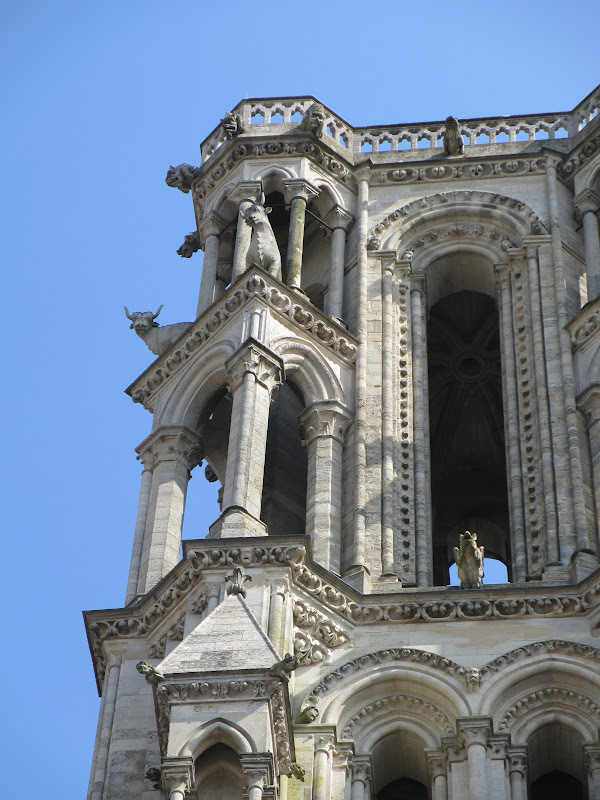 It is where Joan of Arc brought the dauphin (heir apparent), Charles VII, to be crowned in 1429 so that he would be recognized as the legitimate king of France. To be honest, I enjoyed Reims better than Notre Dame in Paris. There were only a few people visiting the day we were there so you could really enjoy the magnificent architecture the building has to offer. 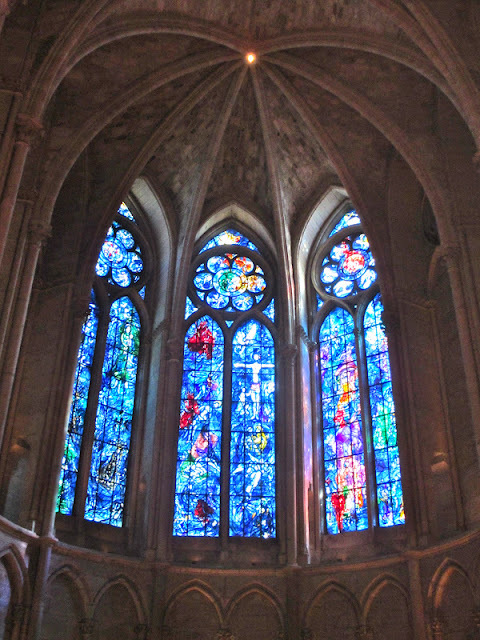 It was also so much brighter due to the fact that so many of the stained glass windows were destroyed during war times and have not been replaced. Our group had a private tour (in English) to give us a just a small insight into the cathedral, the statues, and the stories in found in the windows. So much better than trying to figure it out using a tour book. 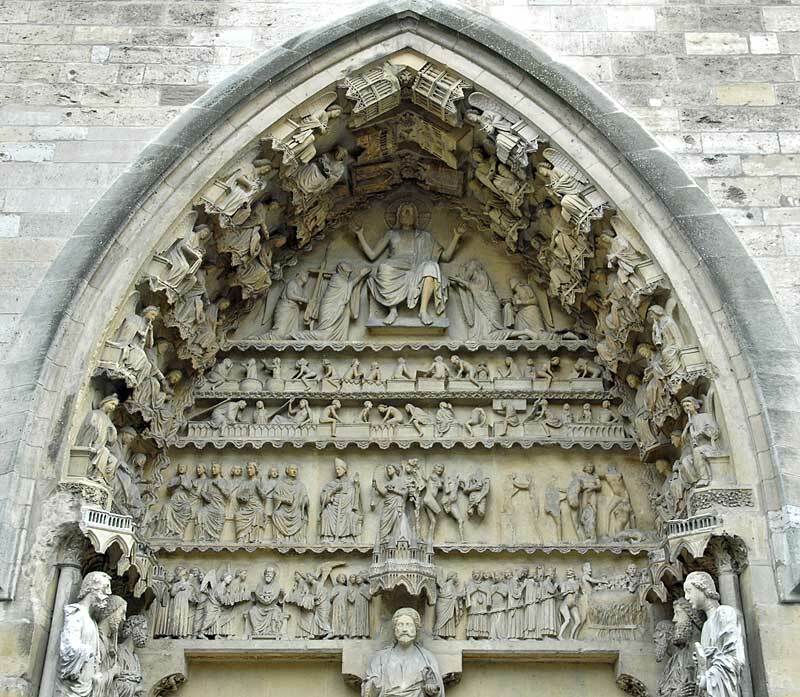 Reims is also known for its statues-there are over 2,300. 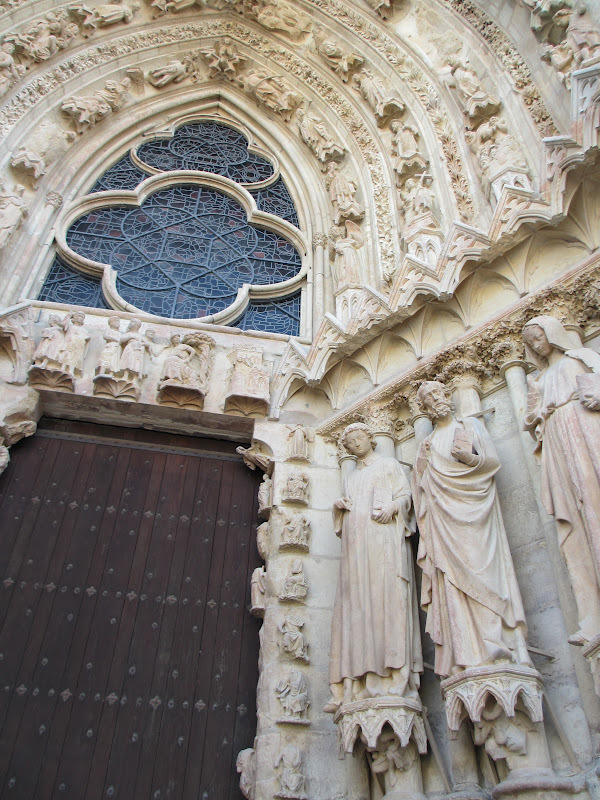 It has the most statues of any cathedral in France. They were everywhere, inside and outside the cathedral. 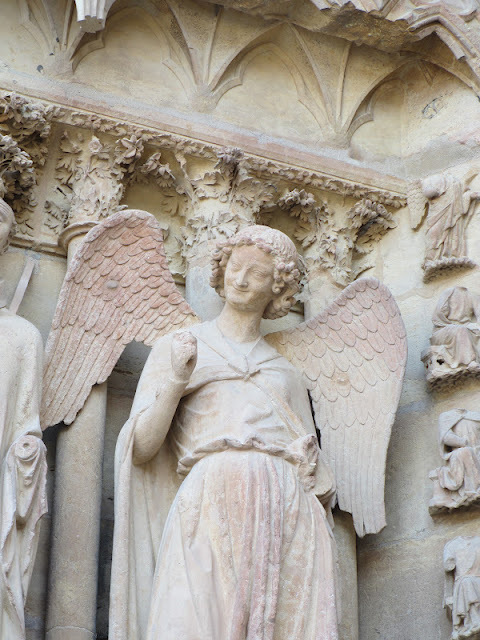 This smiling angel is its most famous statue. One of the things that both Sande and I found amazing was the fact that the images below the rose window, carved into the stone wall, are carved at different depths. Meaning that the images at the bottom are carved deep into the wall and the images at the top are carved shallower so the viewer, when standing below the wall can see all the images. The viewers eye, in an amazing optical illusion sees the the images at the top as the same depth as those carved at the bottom. Should I mention again this cathedral is from the 12th century? 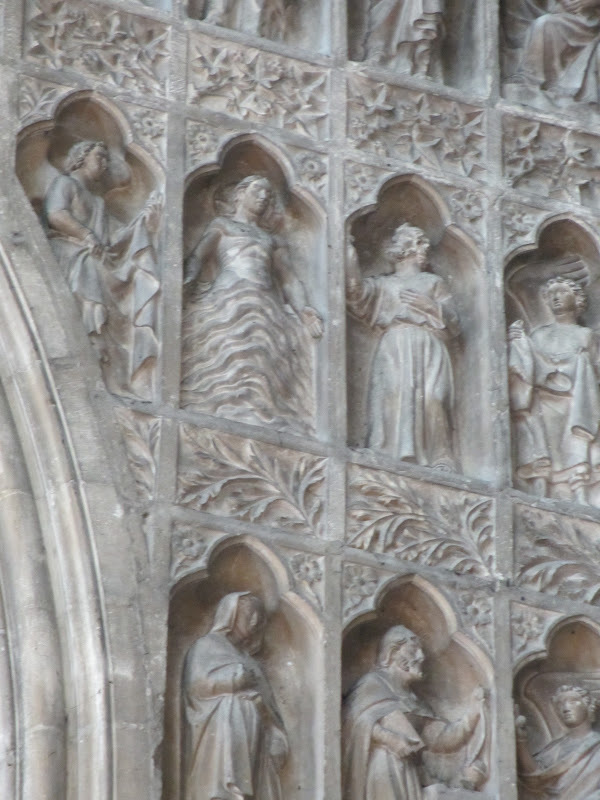 Can you see the carving depicting Jesus being baptized by immersion? This part of the stone wall is on the right, second row from the top. Looking the opposite direction toward the Chagall windows. Marc Chagall designed the huge stained glass window for the cathedral (installed in 1974). It was dark in this part of the church so it's a bit hard to see here but the windows are beautiful. Once again, the tour guide explained may of the images in the windows which made them even more beautiful. I thought this picture might be of interest. It shows what was left of the cathedral after considerable German shelling during WWI. The entire roof section and spires are missing. The photo is thought to have been taken in 1916. We'll leave Reims now with a few of my favorite Instagram photos I took. After a nice lunch and walk around Reims, we are back on the bus and bound for Laon, about an hour North. As the bus drew closer you could see the cathedral in the distance sitting atop a mountain village. There is a Funicular if you want to ride part of the way up but I think a car/bus is best. The streets are very narrow and we were unsure at times if the bus would be able to make it but the driver passed the test even if it meant moving the bus along 1" at a time. 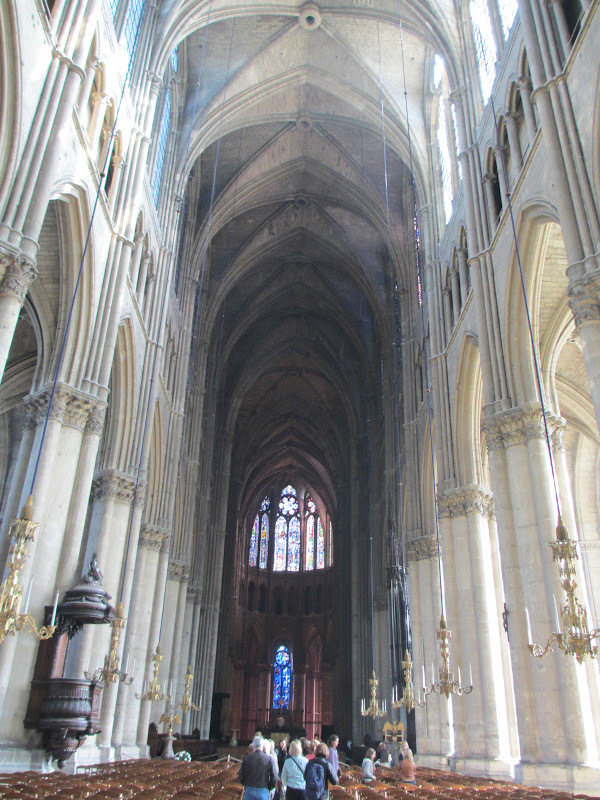 I know, you might just be saying, "it's just another Gothic cathedral" and yes it is, but each have their own beauty. 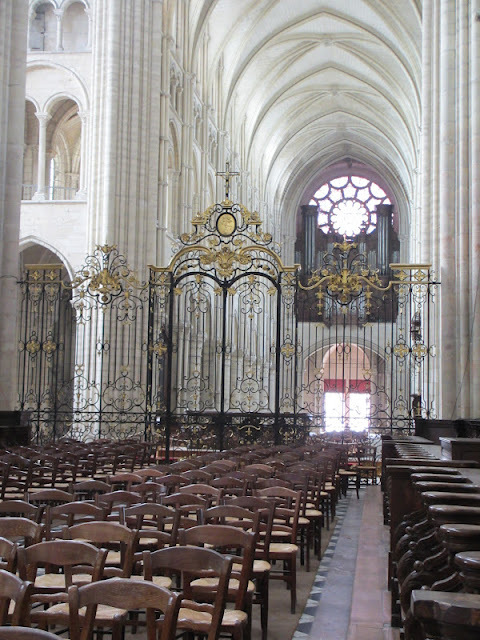 Laon was one of the first Gothic cathedrals to be built. It was started in the 1100s soon after St. Denis (where the kings of France are buried). 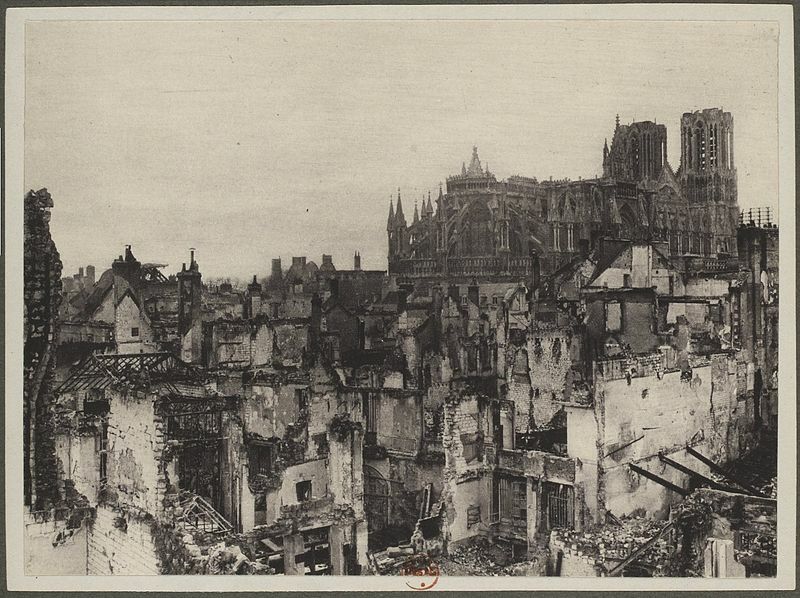 It sustained major damage in the French Revolution but was left unscathed by WWI. Have you ever seen oxen on a church? It even has a hippopotamus downspout which you might be able to make out in the picture above (on the left side where the two arches meet). 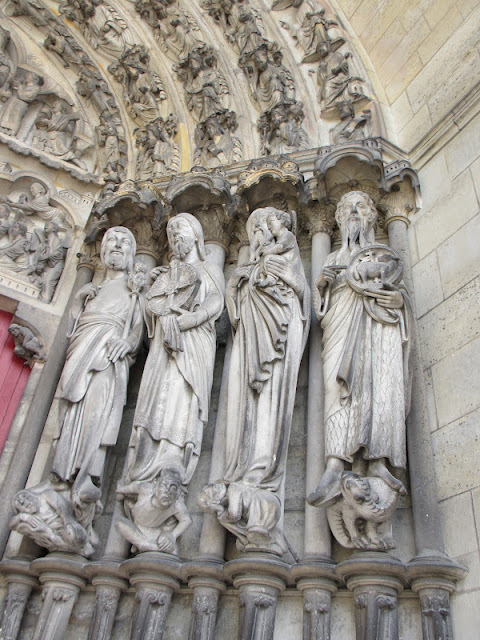 I can't remember the first two statues here but the last two on the right are Simeon, who was promised life until he could see the Savior of the world (holding the baby) and the last is John the Baptist holding the symbol of the lamb. You an see the organ pipes in the background and the gate that separates the nave from the sanctuary. I don't know about you but it reminded me of the wedding scene in The Sound of Music when the nuns have to stay behind the gate as Maria walks up the aisle. The beautiful mountain top town and countryside of Laon. Really, one of my very favorite parts of the day. It felt like you were looking out over a village right out of a Dicken's novel. 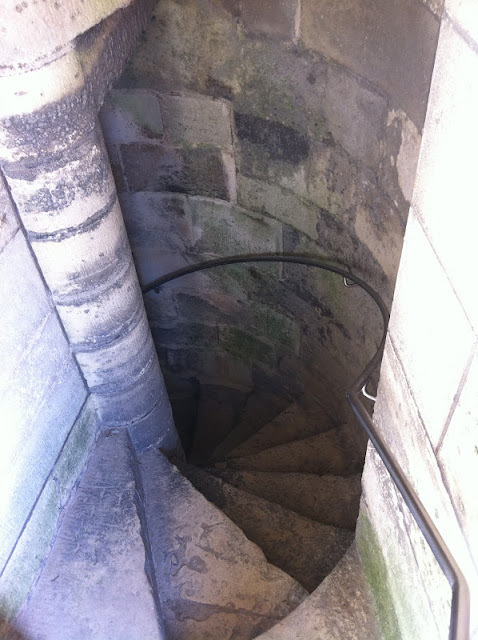 Once we were back down the narrow stairs to the bottom floor we said thank you to our tour guide and walked out into the warm sunshine that had been with us all day. Unfortunately we only had a few minutes in the quaint town of Laon before we had to get back on the bus. 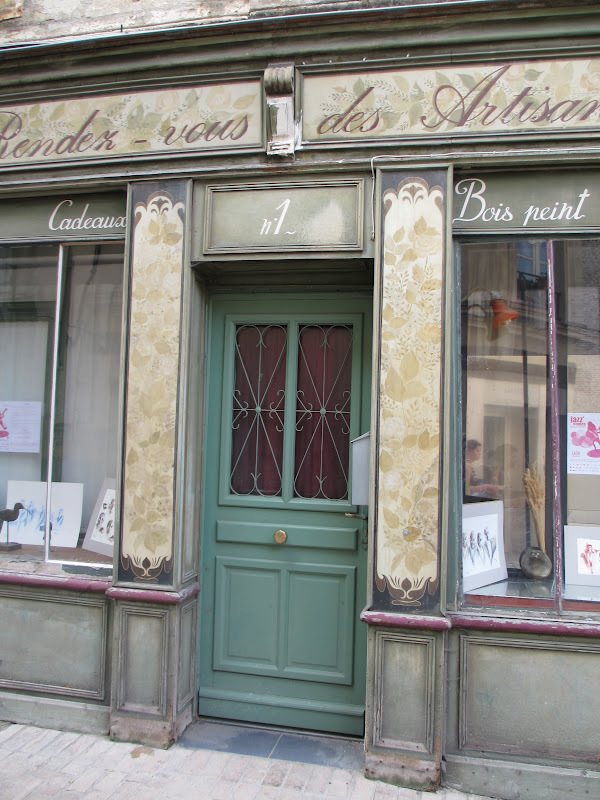 We headed down the narrow street that looked like it might have a bakery to get a pastry and a drink for the trip back to Paris. I stopped to take a couple pictures of shops along the street and then realized, why I am I taking a picture when I could go inside? I seriously only had 5 minutes but managed to find a few items I loved. We had to run back to the bus but it was worth it. 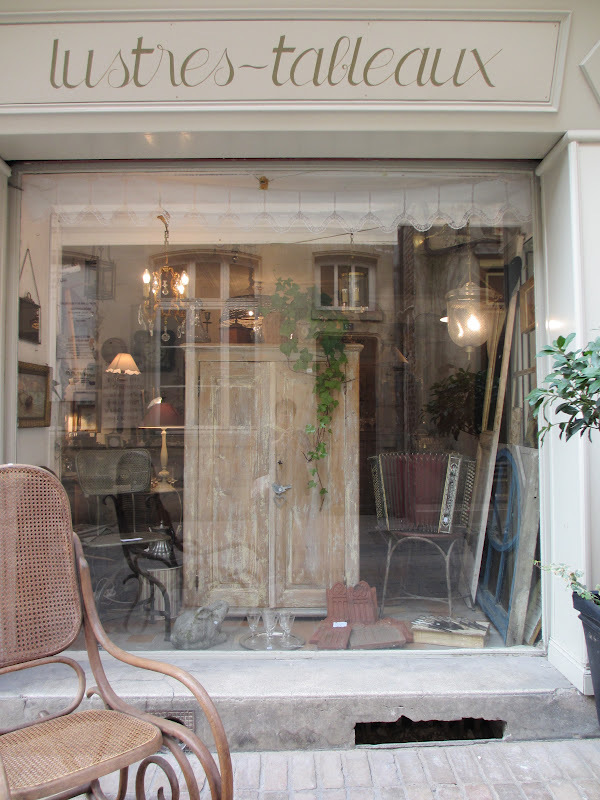 This shop was loaded with beautiful things. I sure wish I would have had time to see more, but not today. What a great day in the countryside. Loved every minute of it. 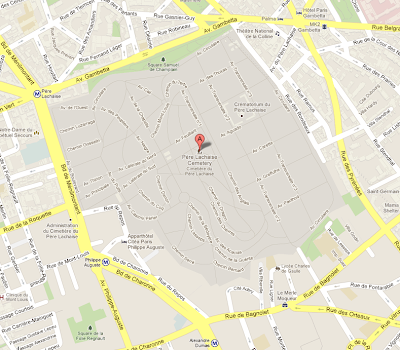 Now one more spot back in the city of Paris, Père Lachaise Cemetery. Yes, I went to a cemetery! 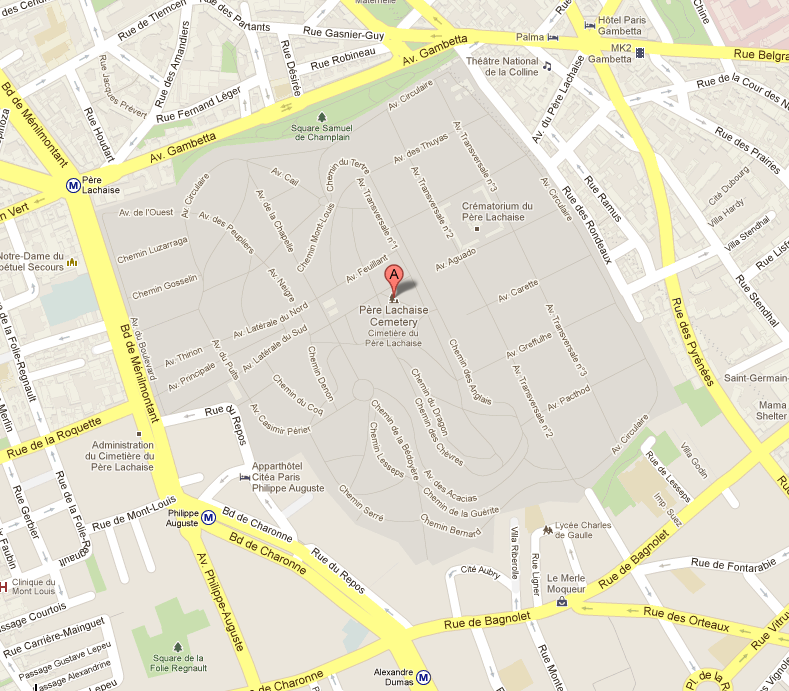 Super easy to get to on the metro on either line 2 or 3, get off at the Père Lachaise stop. The stop is literally yards from the side gate. Bring or buy a walking tour map of the 170 acre grounds. Many famous people are buried here (yes, Jim Morrison is one of them) like Chopin, Colette, Delacriox, Seurat, Oscar Wilde, Gericault, Proust, Modigliani, Victor Hugo, Moliere and even Marcel Marceau. We spent almost 3 hours wondering the cemetery, following our map to find the crypts we wanted to see. Even though we only made it through 1/2 our walking tour I was satisfied we had seen enough of the cemetery. The detail of the old stone markers/mausoleums are fascinating. It is almost unbelievable how many there are and yet they are each so different. There are benches throughout the cemetery to sit and take a rest if you like and with a day like we had it would have been pleasant. UPDATE: Chris T just left a comment about reading a book about Pere Lachaise and when I Googled it I found that the cemetery has an app "Meet Me at Pere Lachaise"... Of course there's an app for that! I did not know I was going to visit the cemetery when I was there so I have not used it personally, but for $3.99 (if you have an iPhone or iPad) I think it sounds like a deal. Looks like they have pictures to help identify the graves and information about the people. Since this post is so long already, I think I will save the travel tips for tomorrow. cheers for a great week! and I will meet you back here tomorrow! PS) If you are interested in a walking tour I did for the 7gypsies blog last week. You can find that here. I love these pictures! The architecture is gorgeous. The apt you stayed in looks fabulous. Thanks so much for sharing your trip with us. Lots of great suggestions and tips for a trip to Europe. Wow! Your images really give a feel to your trip. I have been there too, and the churches are just spectacular! You just can not get enough time in Paris to see everything there is to see. It is such an amazing place. Thank you for sharing your wonderful trip......makes me want to jump on the next flight out! Paris is my absolute favorite city. Love all the architecture, culture, food and just the vibrancy of the city. Thank you! Ohhhh love hearing everything about your Paris trip! 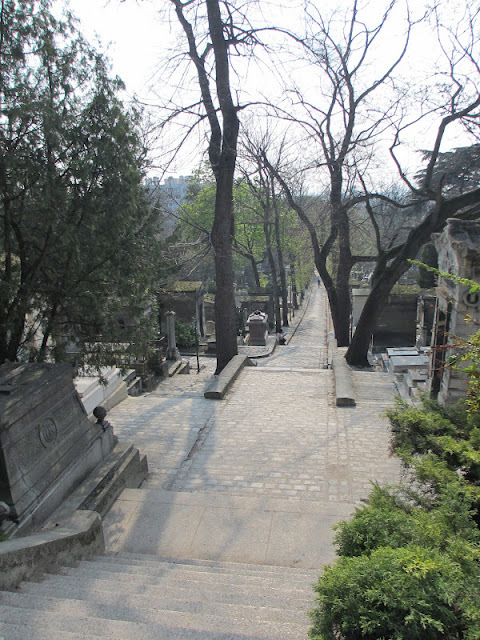 especially Pere Lachaise! 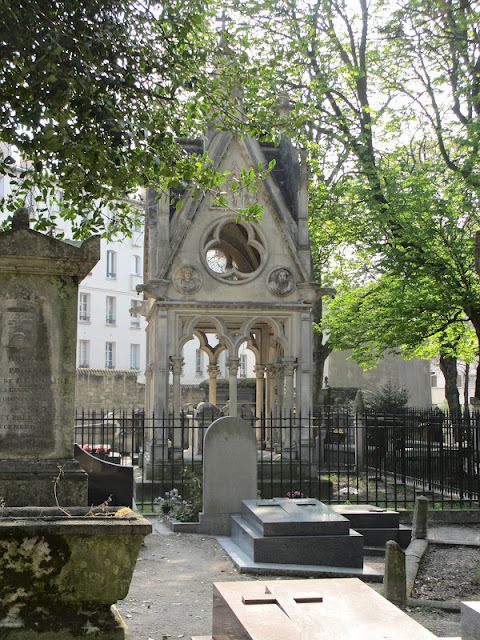 I am reading a novel right now called Murder in Pere Lachaise! it is set in 1890-so fun!! Please go on with your travel info it is wonderful! Thanks everyone for such nice comments today! And thanks to CHris T for leading me to do more research. I mean why wouldn't there be books about this place. 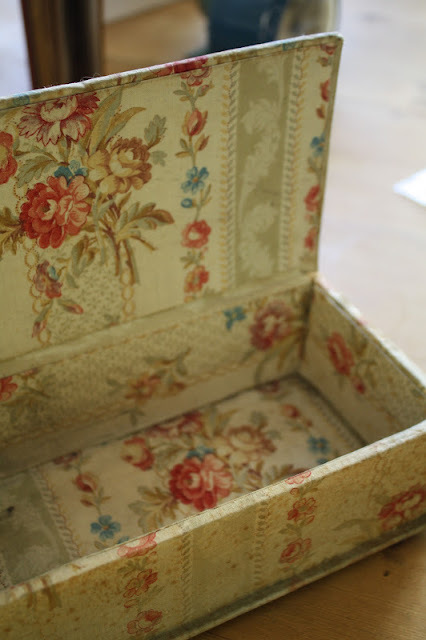 Perfect place for a mystery novel! thank you so much for sharing. i could look at those pictures forever... i adore churches and would even live in one lol .. i cant believe all the detail and history in the stonework.. im in awe.. I'm thoroughly enjoying seeing your pictures and hearing about your trip...especially all the details! I, too, am drawn to gothic cathedrals and old cemetaries with all the interesting old stone. Thanks for taking the time to share all of this! Beautiful pics of France. But I am more excited that you are coming to Australia. Hooray!!! I am booking my spot in the class immediately. Can't wait to sit in one of your classes. Love Reims, I've been there twice and the smiling angel is my favorite. Thanks for bring back the memories. 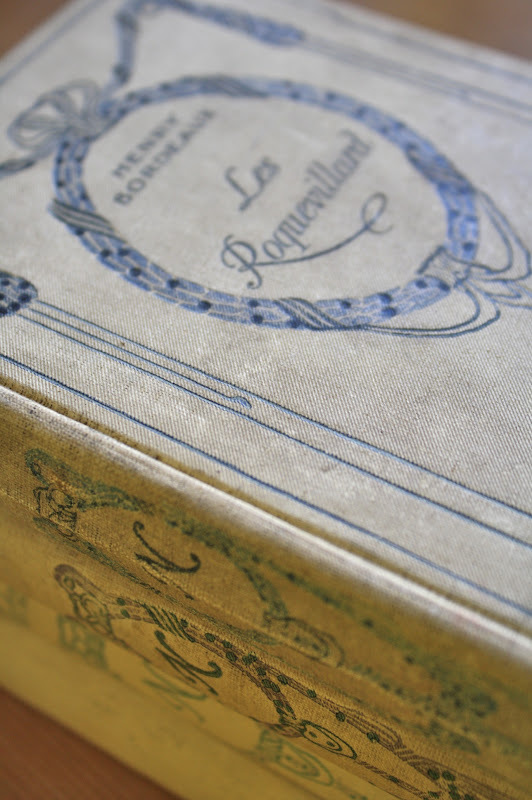 gorgeous images - there can never be too much travelog - especially for France! love, love, love the pictures. I don't mind your posts at all on Paris! 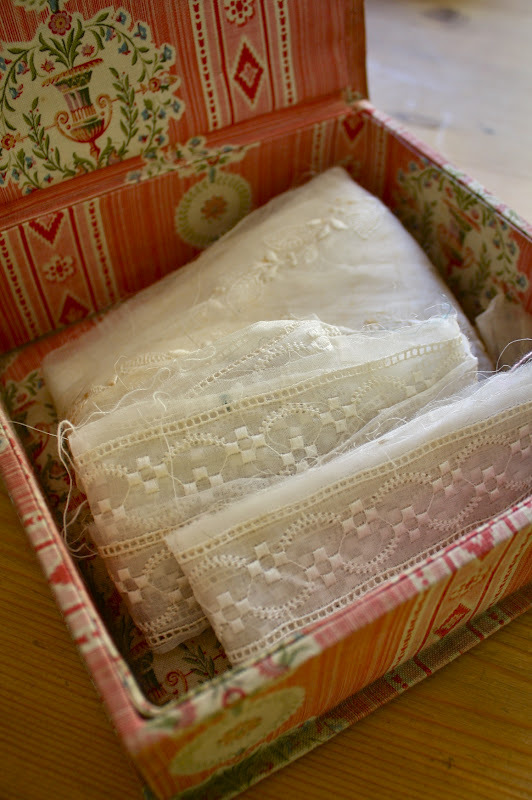 I love them and envy those amazing cloth covered boxes...love the cemetary shots. thanks for sharing with us. I don't know if I'll ever get to France, but I just loved your photos. Your mini tour was fascinating - I loved the buildings, cemetery, market, everything!!! Thank you so much for sharing your trip! I am not bored!! Thank you for sharing your trip with such detail. I will never get there but love seeing your pictures and you telling us about it.